On 28th April this year in its Consultation Response Ofcom indicated that after the current licensing round they would consider requests for Community Radio coverage extensions for existing services (Paragraph 1.17). We’ve had LOADS of enquiries about FM frequency availability – it seems Ofcom want to “outsource” this activity whilst retaining the cards to make a final decision, and without informing consultants like us who could help. We are sympathetic to the cause of new “challenger “broadcasters, but without the resources available to a big Government machine like Ofcom, it can seem difficult for stations to engage with them in a constructive way. We believe the best way is to look at the situation through the “Ofcom periscope” and see the likelihood or not of a given request being viable according to their rules. BUT it’s difficult to give an honest, solid opinion because in addition to Ofcom’s tight technical restrictions (which we can model), they also have to apply judgement decisions – for example is a given interference area significant in terms of size or location? Also as a regulator they have to balance conflicting demand between (say) a Heart FM relay and a new local radio service for your area. We know where the balance should lie, but they have other external pressures! 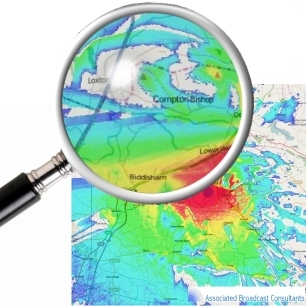 We now think we may have developed a commercially-viable solution that strikes the right balance to estimate FM frequency availability in an area. We base our judgements upon the latest (current) Ofcom technical rules that they use. Some people may suggest that you to adopt alternative rules (like field measurements) to argue against Ofcom (good luck persuading a Government Quango to do that!). But if you want an honest, balanced judgement on frequency availability (using their rules) in your area, from the Ofcom perspective, then we can help. Some more detail available here. This entry was posted in Uncategorized on October 5, 2017 by radiohead.